Ipswich Town owner Marcus Evans has performed an extraordinary u-turn and offered under-fire boss Mick McCarthy a new two-year deal. Unimpressed with candidates emerging since declaring McCarthy would leave Portman Road at the end of the season, Evans has decided it’s better to “stick with the devil you know”. He spoke with McCarthy after yesterday’s exciting 1-0 defeat at relegation-haunted Birmingham City, and thrashed out a new deal within 15 minutes, including a “substantial” pay rise. 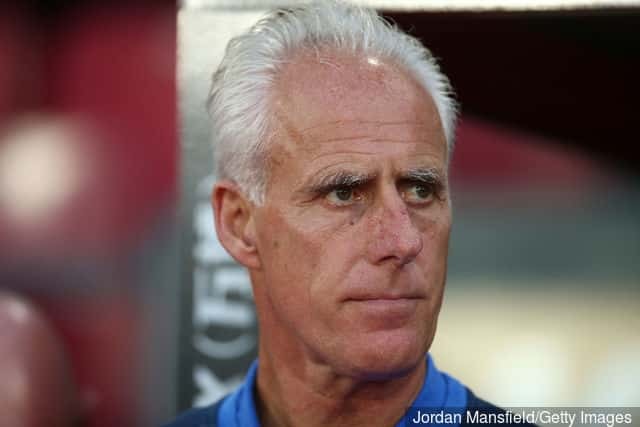 A spokesman for Ipswich Town Football Club said: “We are delighted to confirm that Mick McCarthy will be staying at the club for another two years. A boardroom insider said Mr Evans, who is bailing out the club to the tune of at least £6 million a year, was dismayed by the shortlist being drawn up to be the new boss. “He was looking at the names from his Caribbean mansion on the island of La Fir Polo, and they included nobodies like Tony Mowbray, Nathan Jones, Paul Cook and Paul Hurst – these young men have achieved nothing in the game. “Then there is Danny Cowley, the Lincoln manager, who is only being linked to the job because he knocked Ipswich Town out of the FA Cup when Lincoln were a non-league team. Supporters were delighted with the news, which will be announced officially just before the match against high-flying Millwall at Portman Road tomorrow. Fan Lorraine Fisher, 34, said: “We all love Super Mick, and are thrilled he is staying.